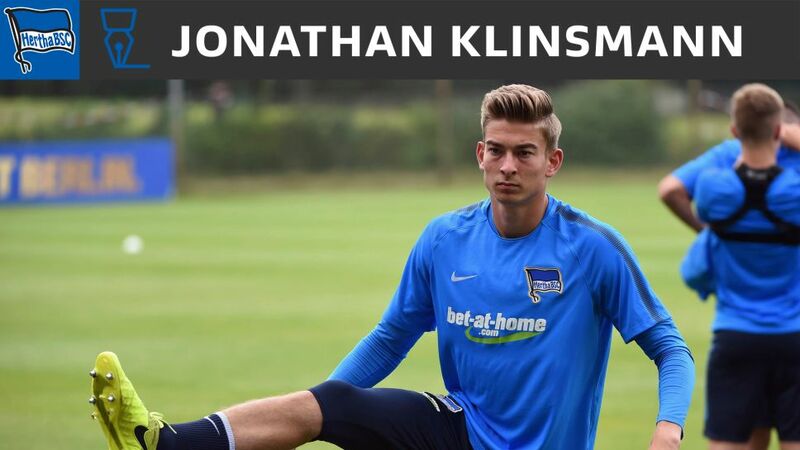 Jonathan Klinsmann has joined Hertha. Hertha Berlin have signed goalkeeper Jonathan Klinsmann, the son of former Germany, Bayern Munich and USA coach Jürgen, to a professional contract. Klinsmann, 20, has been training with Hertha since the start of pre-season last week, and has impressed sufficiently at their Bad Saarow training base to earn himself a deal with the Bundesliga outfit. "After breakfast Michael Preetz [sporting director] told me he wanted to talk to me and informed me that the decision on a contract had just been made," said Klinsmann, whose father has been a club member since 2004 and whose grandfather, Siegfried, was born close to Berlin and grew up a Hertha fan. "It was an unbelievably emotional moment for me, because the club has a history in our family. I'm looking forward to everything with the club, with the city of Berlin and the challenge in Germany." Klinsmann, who grew up in California, had previously had trial periods with Everton, West Ham United and one of his father's former clubs, Stuttgart. He played every minute of his country's run to the FIFA U20 World Cup quarter-finals in South Korea, which is where Hertha approached his famous father about potentially signing him. "Jonathan has convinced us with his ability, his charisma and his ambition. He should now establish himself with us and progress step by step," Preetz, Hertha's sporting director, said. "Klinsmann gives off a calmness and self-belief," said goalkeeping coach Zsolt Petry, who has been working with the youngster along with first-teamers Rune Jarstein and Thomas Kraft. "He has a good right foot and both technically and athletically is at a very good level." Click right here for more Hertha Berlin news!